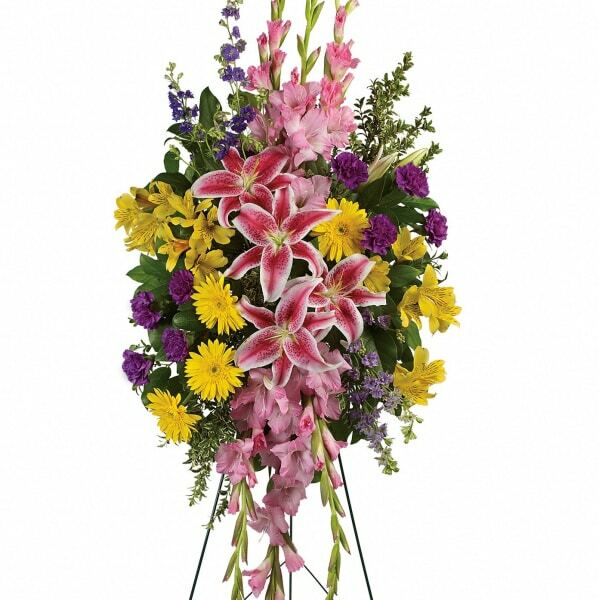 Your sincere wishes for peace and harmony resonate beautifully in this perfectly balanced arrangement of pink lilies, yellow gerberas and purple larkspur. 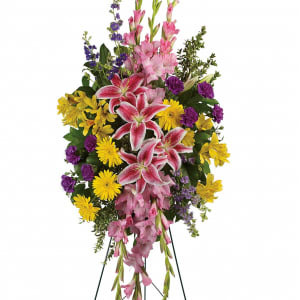 • This inspiring spray includes pink stargazer lilies, yellow gerberas, yellow alstroemeria, pink gladioli, purple carnations and purple larkspur accented with oregonia and lemon leaf. • All arrangements from The Sympathy Store are hand-designed and delivered by a local florist. • An appropriate gift to be sent from a family member, friend, or business associate. 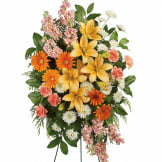 • Standing sprays are traditionally delivered directly to the funeral home or church. 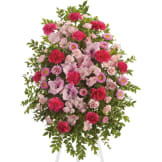 Measures approximately 24" W X 55" H.
Flowers will be received by a B.L. Bush & Sons Funeral Home / Monuments' staff. All of our flowers are designed and delivered by hand from a local florist in in Camillus.